When the Ming Dynasty was replaced by the Qing Dynasty, Chen Wang Ting retired to the Chen Family Settlement to pass his time in studying literature and martial arts, subsequently developing Tai Chi Chuan. It is not clear where Chen Wang Ting originally learnt his martial arts, but there are two popular theories to explain how Chen Style Tai Chi Chuan developed. The first is that Wang Zong Yue’s Wudang Kungfu, or Wudang Tai Chi Chuan as it is commonly known now, is the foundation upon which it is based, because Wang Zong Yue stayed in the Chen Family Settlement for many years and his Treatise on Tai Chi Chuan describes the philosophy and techniques of Tai Chi Chuan superbly. The second theory is that Chen Wang Ting learnt his art in the army as a legacy from Qi Ji Guang, the great 16th century Ming general who repulsed the Japanese naval invasion, because Qi’s masterpiece, The Classic of Kungfu, provides the fundamental principles of Chen Style Tai Chi Chuan. 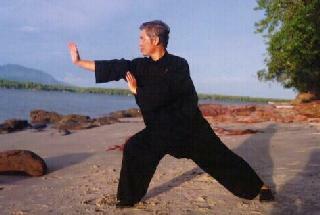 Some people suggest that Chen Wang Ting might have been influenced by Shaolin Kungfu directly, as the Chen Family Settlement is not far from the Shaolin Monastery in the same province, and virtually all Tai Chi patterns and principles, except those touching on Taoist philosophy, are also found in Shaolin Kungfu. Tai Chi Chuan students can derive a great deal of inspiration from the following poem by Chen Wang Ting, who demonstrated the spirit of an unbeatable warrior even though his beloved country had been defeated. This poem also records the process by which he developed Tai Chi Chuan. The Classic of the Yellow Palace which he mentions below is an important Taoist work on chi kung and spiritual cultivation. Sweeping away dangerous obstacles without fears. Allowing me to live till my ripe old years. of the Yellow Palace to accompany me. and healthy to meet life’s expediencies. I must work hard to repay my debts. Humble and tolerant one should always be. Everyone says I have gone mad. But it does not move me. of non-greed for wealth and fame. Let your endurance be like mountains and streams. I am happy like a carefree saint. It is not certain whether Chen Wang Ting invented Tai Chi Chuan, but it is clear that he contributed greatly to its philosophy and in his time the term Tai Chi Chuan became established; before then it was usually called Wudang Kungfu.